Lucky Linderman didn't ask for his life. He didn't ask his grandfather not to come home from the Vietnam War. He didn't ask for a father who never got over it. He didn't ask for a mother who keeps pretending their dysfunctional family is fine. And he didn't ask to be the target of Nader McMillan's relentless bullying, which has finally gone too far.But Lucky has a secret--one that helps him wade through the daily mundane torture of his life. In his dreams, Lucky escapes to the war-ridden jungles of Laos--the prison his grandfather couldn't escape--where Lucky can be a real man, an adventurer, and a hero. It's dangerous and wild, and it's a place where his life just might be worth living. But how long can Lucky keep hiding in his dreams before reality forces its way inside?Michael L. Printz Honor recipient A.S. King's smart, funny and boldly original writing shines in this powerful novel about learning to cope with the shrapnel life throws at you and taking a stand against it. 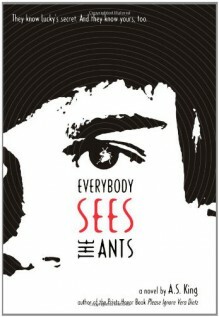 http://Sandy.booklikes.com My Never Ending List 4.5 We all have ants. It's whether you want to admit you have them or not, is the issue. text We all have ants. It's whether you want to admit you have them or not, is the issue. I really enjoyed this book. It was a smooth read that I didn't want to put down. I'm pleased that when I first picked this book up I realized that I wasn't ready for it (in the mood) and put it down. Doing that allowed me time to acclimate myself with the story this time around.